Find here recipes for some Happy(comfort foods) some Healthy and some Fun foods from around the world to enjoy with your family and friends ! An Indian touch to American classics!! Bon Appetit!! I love Spring time,not only for the lovely weather,birds and flowers it brings but also for the abundance of spring vegetables,fruits and salads that are available which taste so fresh and crisp just like the Spring air.I haven't posted a recipe in a while because was busy mulching and planting my flower,veggie and herb kitchen garden.Will post the pics as soon as the veggies start to grow.Have planted Basil,Oregano,Sage ,Thyme,Tarragon,Lavender,Tomatoes,Eggplant,Zucchini,Watermelon,Okra ,Bell Peppers and another long list of flowers some of which have to be planted yet .So please excuse me for not blogging regularly.Here's a delicious Spring salad .Goes well with BBQ chicken or baked fish or even on it's own.I love the combination of early Spring salad mix with delicious strawberries and ripe mango and creamy avocados. Yippeee !!! baked my first loaf of artisan bread today !! There's nothing more satisfying than the whole process of the ingredients mixing together and rising into this wonderful ,wholesome and fresh loaf of loveliness...My kitchen smells like a Parisian boulangerie . Flaxseeds also known as 'Alsi 'in India contain an agent that soothes and protects the lining of the intestine. Sunflower seeds are also an excellent source of dietary fiber, some amino acids ,Vitamin E, B Vitamins and minerals such as copper, manganese, potassium, magnesium, iron, phosphorus, selenium, calcium and zinc. Directions : In a bowl combine the warm water (not hot ),sugar and yeast .Add the 9 grain bread flour and stir .Let bubble and rise for 30 mins. Now add the whole wheat flour,salt and melted butter and mix to form a dough.Add the sunflower and flax seeds and mix well. Transfer the dough on a floured surface and knead well.Add more flour if sticky.Keep working on it for 5-6 mins.Place the dough in a greased bowl and cover with a damp kitchen towel and let rise for 1-2 hours in a warm place.It will double in size. Punch down and divide into 2-3 loaves. Shape the loaves .Press black sesame seeds on top. Transfer to loaf pans or baking sheets and let it rise one final time for 30 mins till it is an inch above the rim of the pan.Bake at 350 F for 30 mins . Do not overbake.Brush with melted butter. Chocolate's in the air -Sweet treats- Happy Valentine's Day !! 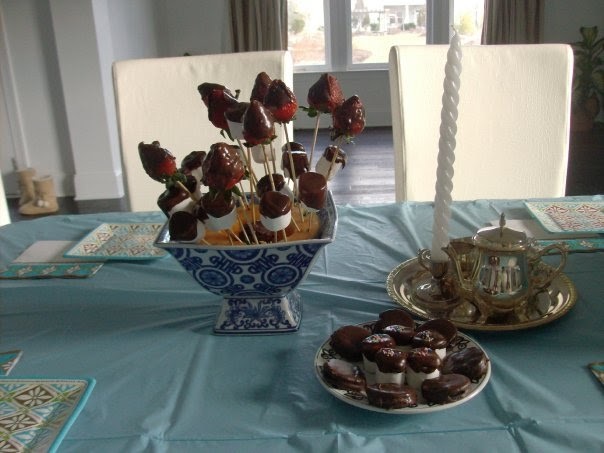 If it's Valentine's Day there has to be chocolate in the celebration.These chocolate covered strawberries,marshmallows and Oreo cookies are a breeze to make and super to taste. Tip: Use the highest-quality chocolate you can buy. Good chocolate has a glossy sheen and a smooth taste. 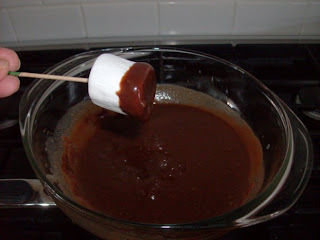 Directions: Melt the chocolate and the heavy cream in a double boiler ( Fill a pot with 3 inches of water.Bring it to a boil.Place a thick glass bowl on top of the pot .Add the chocolate and heavy cream in the bowl and keep whisking with a fork till it melts and forms a smooth glossy velvety liquid.The chocolate should only melt with the steam from the water i.e the water should not touch the bowl.Turn off the heat and let cool for 2 mins. 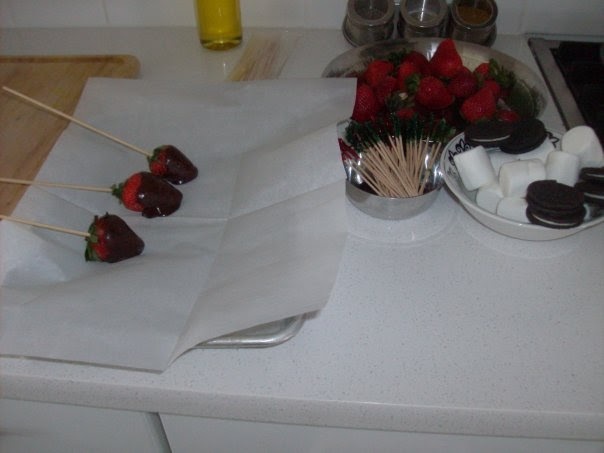 Dip the strawberries last or they'll get cooked in the hot chocolate.. Skewer the fruits and marshmallows .Dip in the chocolate and allow to dry on a wax paper. Cut a cantaloupe in half and use it as the base of your edible bouquet to arrange the skewered strawberries and marshmallows. You can use any other fruits of your choice. Get the kids to pitch in .They'll love it. Enjoy your creation.!!! 1 packet Knorr Chinese hot and sour soup . and bell pepper and saute for a few minutes. Add 1 cup water and the entire packet of Knorr hot n sour soup.Bring to a boil and let it thicken stirring at regular intervals.If it's too thick add a little more water .Add the cooked chicken and spring onions and garnish with coriander leaves(cilantro).Serve hot with noodles or rice. Ready in minutes .This healthy and delicious dish is great for the days when you are too rushed to make a proper meal.Pair with your favorite soup to make a great lunch.Also a great way to use up Rotisserie chicken.The Pimento cheese and Pepperjack add a nice spice to it. Heat Panini press or grill to high. Spray with cooking oil. Spread the basil pesto on one slice of bread .On the other slice spread the pimento cheese spread,top with chicken and Pepperjack cheese slice .Cover with the basil pesto layered slice of bread. Drizzle with olive oil. Toast on the Panini press till crisp and golden brown.Serve hot with your favorite soup. Wishing all my friends a very HAPPY DIWALI and a PROSPEROUS NEW YEAR !!! Hope everyone had a fun and safe Diwali ! !Made these nankhatai for Diwali .The recipe is very simple and super easy to make once you get the ingredients measured correctly.These are made in pure ghee the old fashioned way instead of margarine.The difference in taste is substantial because of the ghee. Thandai powder has fennel,poppyseeds,cardamom,nutmeg etc which gives a very exotic flavor to the cookies.Once you get around making these you'll never go back to store bought ones.You can also make these plain by just adding cardamom seeds and omitting the saffron,almonds and pistas and Thandai powder. In a bowl mix together the flour,baking soda,salt,thandai pwdr and set aside. Melt ghee in a saucepan over low heat. Add sugar and stir to dissolve 2-3 mins. Remove from heat and combine with dry ingredients. Add crushed cardamom seeds ,saffron,chopped almondsl and pistachios and combine thoroughly with a wooden spoon.When the dough is cool enough to handle mix with your fingers and knead to form a ball. While it is still warm divide dough into 16-20 small walnut size balls .Roll each between your palms ,flatten slightly and place the discs on a cookie tray lined with aluminum foil 1 inch apart.Press a few slivered pieces of almond and pistachios on top of the cookiesBake 15-20 mins or till the bottoms are lightly colored.Cool and store in an airtight container. I created this recipe for Halloween. This deliciously spiced cake has all the flavors of autumn .The rustic taste of pumpkin and crystallised ginger are enhanced by hints of warm spices like cinnamon,nutmeg and cloves.Toasty pecans add a nice crunch . Don't get discouraged by the long list of ingredients.Once they are at hand this cake is a breeze to make and worth the effort .Serve hot with coffee or tea with Spiced Gingerbread Butter(Williams Sonoma makes an excellent one ) Click on the pictured for an enlarged view . Preheat oven to 350 F .Line a 9 inch round pan with parchmant paper. Mix the flour,salt,baking soda ,baking pwdr,instant pudding powders,cinnamon,nutmeg,clove powder and sift to mix well.Add the chopped crystallised ginger and pecans and toss well. Keep aside. In a mixing bowl mix the sugar and vegetable oil with a electric mixer ,add the pumpkin puree,apple sauce and 1 egg at a time and beat well till they are mixed together. Slowly add the dry ingredients to the wet and mix well to form a thick batter. Pour in a baking pan or cup cake pan and bake at 350 for 40 mins or till toothpick inserted in the center of the cake comes out clean. We all know the secret to making a deliciously moist pound cake is adding sour cream to it.In this recipe sour cream is replaced with Ricotta cheese which is a smooth ,creamy, mild cheese .The results are a deliciously light,moist and fluffy pound cake. Orange marmalade and zest add a lovely citrus flavor and lightness to it.This is one of Giada's recipes.The only change I have made is replaced 1/4th cup sugar with 2 tbsp orange marmalade . Preheat the oven to 350 degrees F. Grease a 9 inch round pan with butter. In a medium bowl combine the flour, baking powder, and salt. Stir to combine. Using an electric mixer, cream together the butter, ricotta, and sugar until light and fluffy, about 3 minutes. With the machine running, add the eggs 1 at a time. Add the vanilla , orange zest ,orange marmalade and Amaretto until combined. Add the dry ingredients, a small amount at a time, until just incorporated. Pour the mixture into the prepared pan and bake until a toothpick comes out clean and the cake is beginning to pull away from the sides of the pan, about 45 to 50 minutes. If the cake is still moist at the center move it to a lower rack in the oven and bake for an additional 10 mins.Let the cake cool in the pan for 10 minutes then transfer to a wire rack to cool completely. Dust with powdered sugar and serve with strawberries. 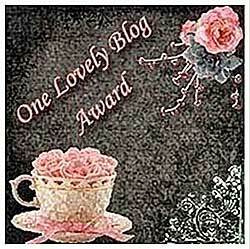 A big thanks to Jay who writes a wonderful blog Tasty Appetite for the above award. 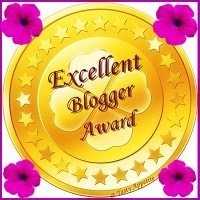 and Chaitrali of I'm not a chef for sharing this award with me which I would like to share with all my blogger friends.Your comments and suggestions are always greatly appreciated. This delicious and highly nutritious Mexican dip is a breeze to make .You can leave it chunky as I have or run it through a food processor to make a smooth dip. Serve with tortilla chips or add to tacos. Cut and dice the onion,avocados ,tomato.Add salt,lime juice,jalapeno ,cilantro and sour cream and mix together.Alternately you can run these through a food processor to a smooth finish. Sorry friends haven't posted any recipes since the last week.Did cook a lot but couldn't blog as had a super busy week with Navratri,Dassera,pooja,havan at home and if that wasn't enough our town hosted their annual Diwali function last week and my kids had participated in a dance for that.So in between school, dance practices,dress rehearsals and temple visits I was also allocated by the choreographer the task of buying thirty yards of fabric and cutting 16 skirts ,scarves and dupattas out of them which were then stitched into dance costumes by the moms .Believe me I haven't cut so much as a handkerchief in my life so with this enormous task on hand had a really busy time juggling several things at once..Everything turned out great in the end.The costumes and the kids in them looked oh so cute,the dance went off well,managed to clean and prepare the home before the pooja and havan and could also visit the temple for a couple of nights on Navratri and the Ram -Leela and Raavan dahan on Dassera.Here are some pics below as well as a recipe for Mohan -thal a fudge made out of gramflour. A delicious ancient recipe made out of gram flour which stays good even without refrigeration.Gram flour when roasted in ghee emits a delicious nutty aroma and taste. Take the gram flour in a dish .Add the 2 tbsp warm milk and 2 tbsp warm ghee to it .Mix the flour well and leave aside for 5 mins. Seive it through a thin seive .The consistency of the seived flour will be like semolina/rava . Heat the ghee in a non-stick pan. Add the seived flour to it and roast stirring constantly till the flour changes color to a light brown and emits a lovely nutty aroma.Once it cools adds the cardamom and nutmeg opwders to it. In another vessel,make the sugar syrup by adding equal quantity of water to the sugar and boiling it together to a one thread consistency.Add a pinch of saffron to it while it boils.One both cool mix them well..grease a steel thali and spread the mixture evenly on it. Decorate with slivered almonds. .Once cool cut into rectangles. Cooking has always been a passion for me since I was a young girl growing up on the tropical metropolitan island of Mumbai,India.I was familiar mostly with the large assortment of Indian dishes and also Chinese and the occasional pizza and pasta.It was ten years back when my husband and I migrated to the USA that I was introduced to this whole global food market present here and how !! Since then it has been a very pleasant and enjoyable journey as I tried out recipes from all over the world :American,Italian ,Chinese,Mediterranean,Japanese,Thai,Mexican and ofcourse Indian . Hope you enjoy the dishes as much as I did preparing them . All recipes and pictures on this website are the sole property of Ragini Miranda. Simple theme. Theme images by Raycat. Powered by Blogger.